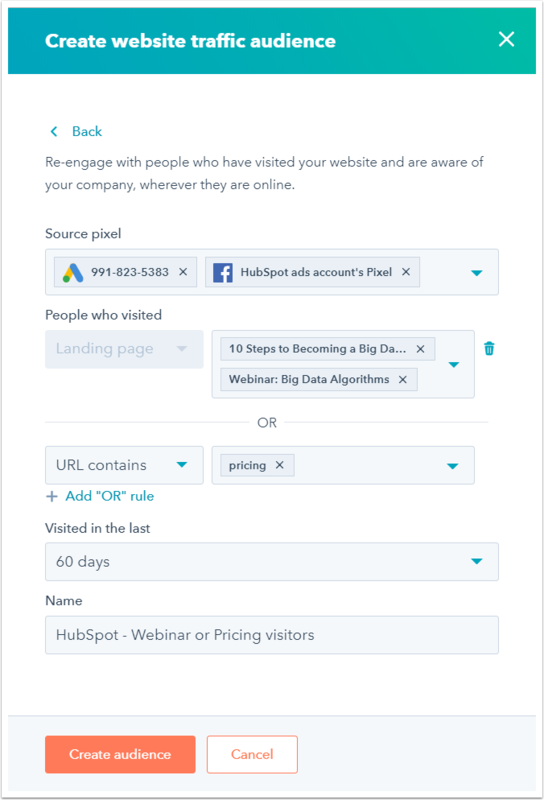 If you've connected your Facebook Ads, Google Ads, or LinkedIn Ads account to HubSpot, you can target your ads at specific audiences. 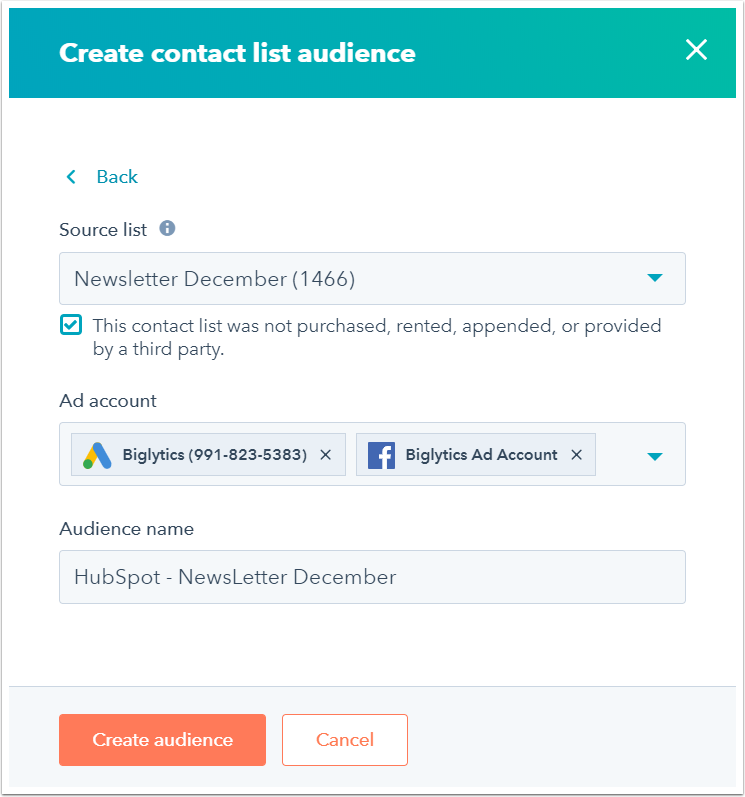 Ads audiences created in HubSpot are automatically synced with the respective ad networks, and are automatically updated as new visitors come to your site and as contacts are added/removed from HubSpot contact lists. Please note: Facebook Ads accounts must be associated with a Facebook Business Manager in order to create Facebook Ads audiences in HubSpot. Use a website visitors audience to target your ads to people who have visited your website in the past. Your audience will include anyone who has visited your website in the last 60 days and will be available to use once your site receives 200 new visits. In the upper right, click Create audience. In the right panel, select Website visitors. Under Source pixel, click the Select a pixel dropdown menu. If you've previously added your ad pixel(s), select your Facebook, Google Ads, and/or LinkedIn Ads pixel. To add a new pixel, click Add a pixel. Under People who visited, click the dropdown menu and select Landing page, Blog page, Website page, All website pages, URL contains, or URL equals. If you select Landing page, Blog page, or Website page, click the Search dropdown menu and select the corresponding page(s). If you select URL contains or URL equals, click the Type a rule field and enter a rule, then press the Enter key to add the rule. Click Add "OR" rule to add rules to expand your audience. For example, you can use "OR" rules to target visitors on your pricing page, or on your contact page. (Optional) Under Visited in the last, click the Select dropdown menu to select a timeframe from 7 to 180 days within which a visit occurred in order for a visitor to be included in the audience. Please note: it's not possible to customize the timeframe for website visitor audiences for LinkedIn, which limits the creation of visitor-based audiences to the last 90 days. Enter a Name for the audience. 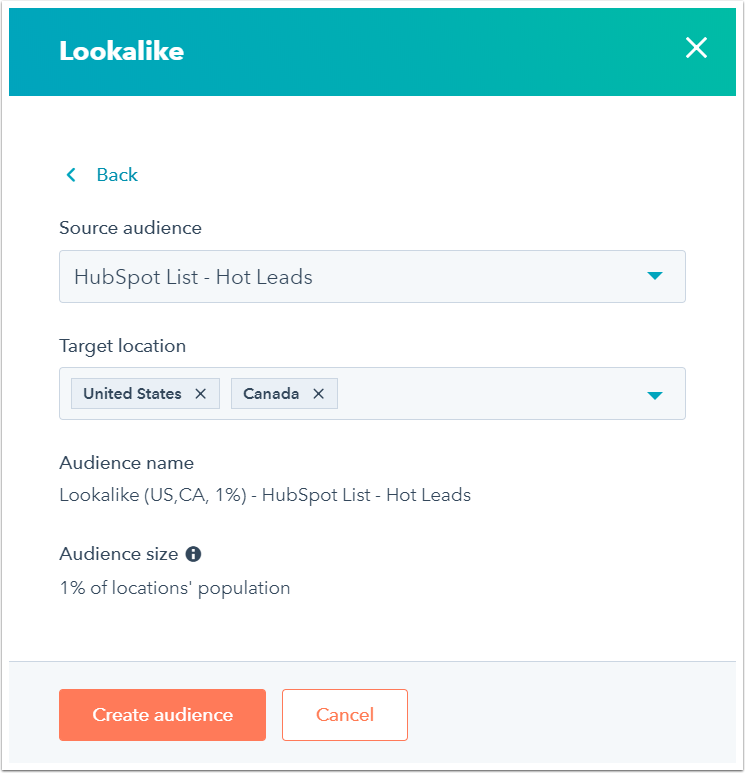 Once your audience contains at least 20 people, it will be available for selection in the Audiences section when you create a Facebook lead ad in HubSpot. In the right panel, select Contact list. Click the Source list dropdown menu and select your list. Please note: your list must have at least 20 contacts. To get the most out of your ad spending, it's recommended that you use a list with at least 1,000 members. Select the This contact list was not purchased, rented, appended, or provided by a third party checkbox. Click the Ad account dropdown menu and select the checkboxes for the Facebook Ads, Google Ads, and/or LinkedIn Ads account(s) you want to use this audience for. By default, the audience name will be HubSpot - [Name of list]. Edit the Audience name as needed. Your audience will appear in the Audiences tab with a Preparing status while it is synced to Facebook, Google, and/or LinkedIn. Your audience may take up to 24-48 hours to sync. Marketing Hub Professional accounts can create up to 5 contact list audiences, and Marketing Hub Enterprise accounts can create up to 15 contact list audiences. To create an additional 50 contact list audiences on top of your subscription limit, purchase the capacity pack add-on. Each ad network place certain conditions on advertisers before they can use audiences. For example, Google states their requirements, while Facebook generally requires users to have some advertising history but does not explicitly state their requirements. If you meet Google's requirements for creating a contact list audience, but are seeing an error when you try and create a contact list audience, contact HubSpot Support. With lookalike audiences, you can target your Facebook ads to users who are similar to one of your existing website visitors or contact list audiences (Marketing Hub Professional and Enterprise only). Google Ads automatically creates similar audiences for you when they meet the required criteria, which is analogous to Facebook’s lookalike audiences. In the right panel, select Lookalike. Click the Source audience dropdown menu and select an existing website visitors or contact list audience. Click the Target location dropdown menu and select the country or region(s) you want to target with this audience. Hover over an existing Facebook Ads audience and click Create lookalike. You can view and manage your ads audiences on the Audiences tab of your ads dashboard. Click the Audiences tab. Here, you'll see a list of your ads audiences. To sort by name, type, source, matched size, and ad account, click the corresponding column header. Please note: the Matched Size column displays the number of HubSpot contacts that the ad network was able to match to existing users in their database. Identifying information such as first and last name, date of birth, phone number, and email address are used to help ad networks match these users. To remove an existing audience in HubSpot, click the audience name. In the right panel, click Delete. This will remove the audience from HubSpot and prevent any further data from syncing to the ad network. To completely delete an audience, it must be removed from the external ad account as well.